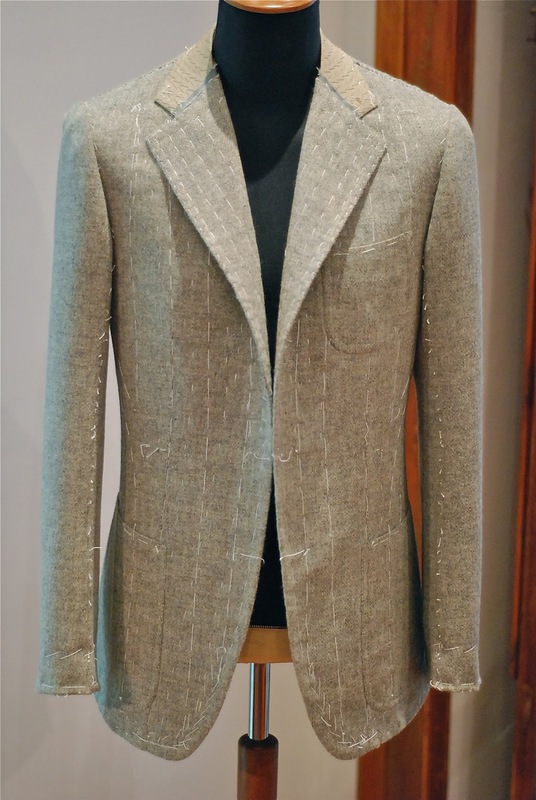 After months of indecision, I finally decided to have my length of Permanent Style tweed made up by Elia Caliendo in Naples. Every time I have been to Graham Browne recently, I see another length being made up for a reader. It looks beautiful, such a nice pale grey from a distance but with subtle colour up close. I finally cracked and gave the cloth to Elia when he was in London recently (he visits at least once a month). 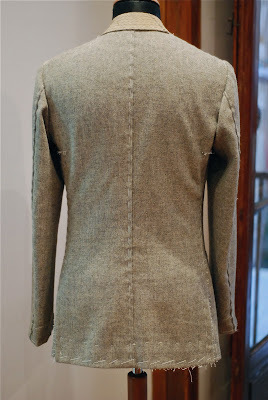 Interestingly, Elia thought it was cloth for a woman’s jacket, as it was made on a single-width loom up in Lewis and was therefore half the width of regular jacketings. He says only women’s jacketing is ever made at that width in Italy. For men, only the Riva cotton shirting is made single width, as it too uses old-style looms. I reassured him that this was a manly material. Given where it was woven, looking out onto the Arctic Ocean, it has to be. 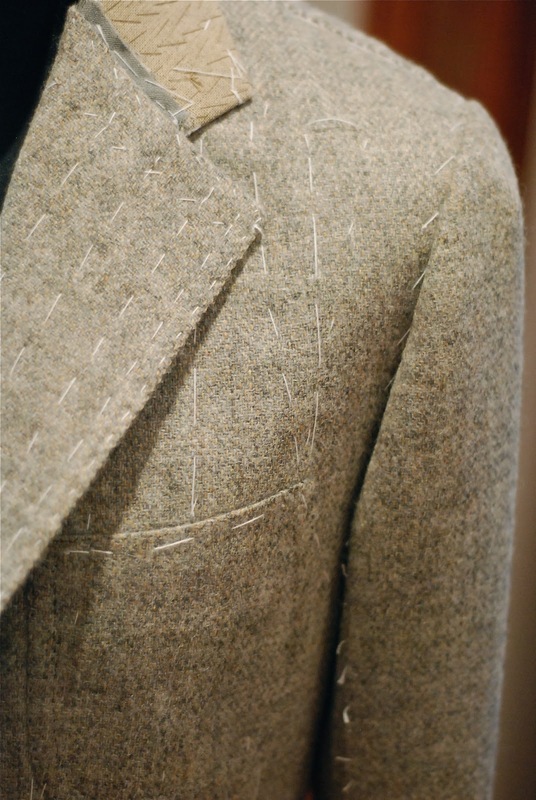 I’m hoping that the softness of the Neapolitan construction and having the jacket half lined will enable me to appreciate the weave of the Permanent Style tweed. On the first fitting, pictured, in Naples, it certainly looked great, with the overlapping seams on the shoulder and down the back emphasising the texture of the material. It will be made up, as with my first jacket, with three patch pockets and the ‘spalla camicia’ shoulder. I was a big fan of that first jacket and have recommended Elia to everyone I know since. It is the best fitting and among the best-made Neapolitan jackets I have seen. In particular, the collar hugs the neck very well, something I have seen other Neapolitan makers fall down on. A search on Permanent Style and The Rake online will give more background information on Elia. I should say as well, by way of recommendation, that Elia’s English and age mean he is someone I can see myself establishing a relationship with over the years – something I only see with Luca Rubinacci elsewhere in Naples. You can follow the discussion on Elia Caliendo: tweed jacket by entering your email address in the box below. You will then receive an email every time a new comment is added. These will also contain a link to a page where you can stop the alerts, and remove all of your related data from the site. Beautiful. That collar roll and the shoulder line! I’m looking forward to seeing this completed. Very nice cloth indeed, Simon! For a man with your build that stands 5 feet 11 in., how much cloth would you reckon is necessary for a jacket like this? Much obliged for your blog and tip. I’m looking forward to seeing the finished product as well. Just stumbled across your blog and it is great. I’m in the men’s fashion industry and am a grand admirer of tweed. How much does a suit start at with caliendo? Superchick, I think it you that’s ill if you think you can get a quality jacket for 160. Do you have any pictures of the finished jacket ? Some Harris tweed cloth has recently been donated to me, and I would love to have a casual blazer made. Whilst I clearly have an excuse to visit Naples, would you be able to recommend someone in the UK? Absolutely. A lot depends on price and desired style, but try Anderson & Sheppard or Steven Hitchcock. If you want someone a lot cheaper, maybe Graham Browne. Simon, do you have photos of the finished jacket? As with the other Caliendo jacket you have posted about, I am particularly interested in the shape of the patch pockets. Do the hip pockets have a curved top or straight? Why is the jacket double, and not single vented? I don’t have any single-vented jackets, and few tailors would recommend one. A double vent is much more elegant, and avoids flashing your bum whenever you put your hands in your pockets. Hi Simon, did you come across a similar fabric ? Is there something similar in P&H or W Bill? No sorry, but we are reweaving the PS Tweed with Breanish now – should be available in a few weeks, so good timing on the question!